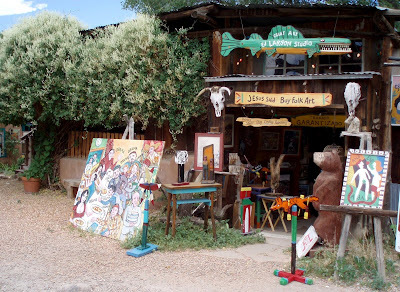 On the east side of Santa Fe you'll find Canyon Road, a narrow, winding lane that is home to some of the finest art galleries and restaurants in town. Many of the buildings were once private residences, and the lovely gardens that grace the street make this a must-see for art lovers and gardeners alike. Indeed, as you can see in the photo above, the art and the gardens play quite well together! Canyon Road is an eclectic mix, to be sure. 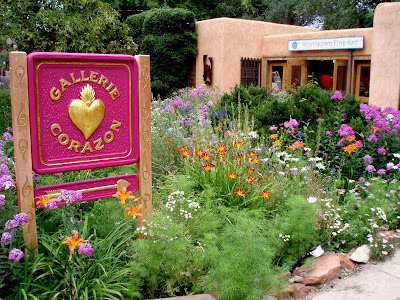 Here a folk art gallery makes a bright splash. I was particularly impressed with the lavish fall of Polygonum on the wall; commonly called Silver Lace Vine, it is an incredibly vigorous thug in California, and for that reason I never plant it. But I appreciate it here, and Santa Fe's long, cold winters keep it (somewhat) in check! 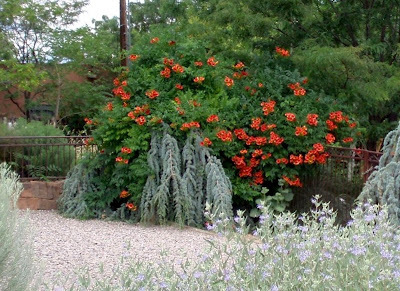 Santa Fe is high desert (elevation 6500') and has a fairly short growing season. 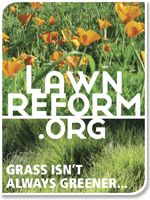 June is peak time for spring wildflowers, July brings the spectacular summer perennials, and by September it feels like fall. Here pink phlox, orange daylilies and white Shasta daisies mingle beautifully with the soft foliage of annual cosmos in a large cottage garden-style bed; the colorful gallery sign is a work of art in itself! 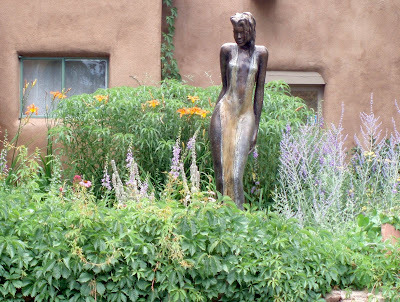 Just over an adobe wall was this elegant sculpture garden; the refined plant palette of native juniper and pine, purple Smoke Bush and variegated Miscanthus around a pocket lawn makes a cool refuge on hot days. The pink splash of hardy geranium is a perfect accent. On the other side of the perennial bed pictured earlier you'll find this rustic bench and trough planter; a perfect spot for us flower-loving lowlanders to catch our breath! 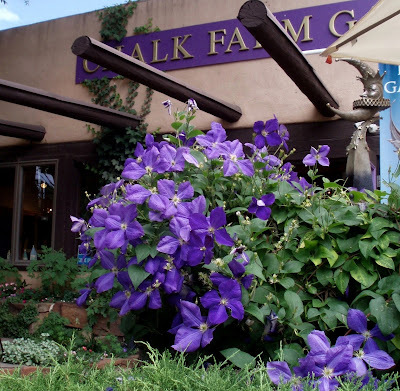 What an inspired choice to plant in front of this gallery; I wonder which came first, the clematis or the sign color? 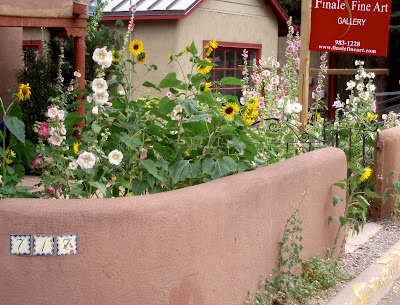 No report on Santa Fe gardens would be complete without Hollyhocks and Sunflowers! I'm so envious; the leaves on my hollyhocks always look rather leperous by the time they bloom! They must appreciate the low humidity here. The little volunteer sunflower growing in the gravel strip is just the kind of touch I like. I love the way this whimsical wall encorporates the remains of a previous resident, although can't help but wonder if the wall was the reason for the tree's demise? 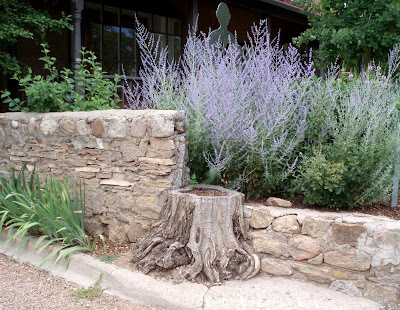 Lovely lavender Perovskia (Russian Sage) is a lot tougher than it looks; it blooms all season with minimal care. Now THIS is the way Campsis radicans (deciduous trumpet vine) should look! I love the way it flows around the weeping blue Atlas cedar. In the foreground is a lush stand of Caryopteris and the tall silver Artemisia native to these parts. Santa Fe has the BEST Buddlejas; full, lush and fragrant. 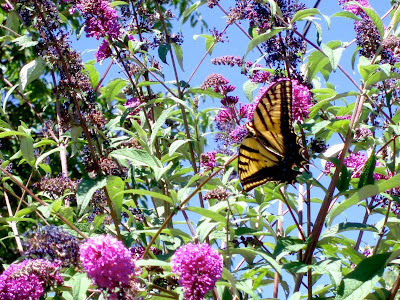 This enormous Swallowtail butterfly was kind enough to drop in and enhance my photograph. All of these shots were taken on the same day, in one half-hour stroll. Beautiful! 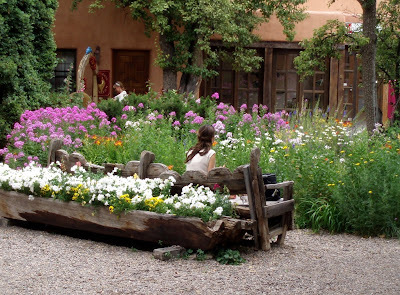 These pictures make me want to go to Santa Fe. 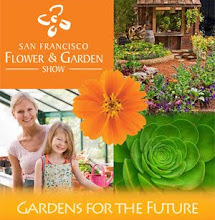 I am surprised that you have trouble growing some of the stuff you've mentioned here....is San Jose that humid? What a beautiful post! 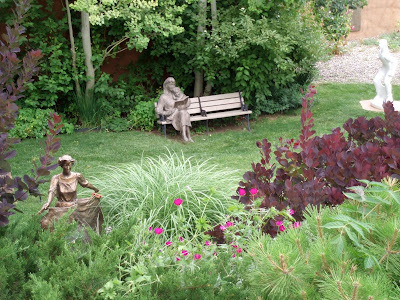 Love the sculptures and the smokebush .... Such vibrance in all the plantings! Great pictures! 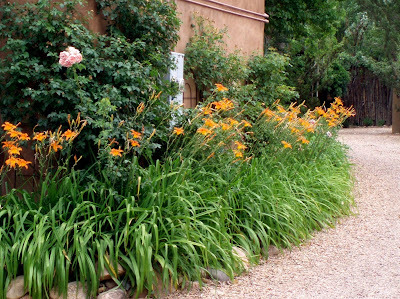 Your images capture the beauty of the lovely gardens on Santa Fe's eastside. 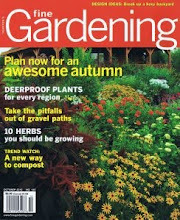 We look forward to your visit to High Country Gardens. Ava, wonderful! Planning on Wednesday; wonder if David will be around? Would love to interview him (or someone) for my post!